The plot to kill Nicolás Maduro | Fight Back! 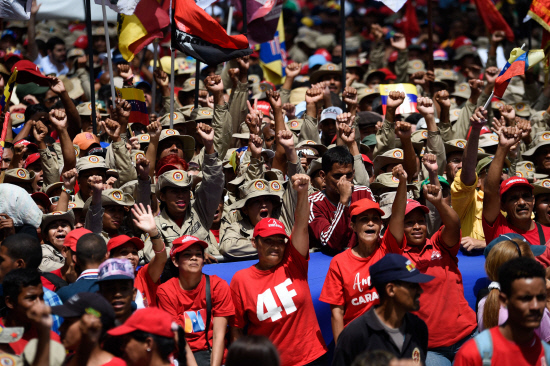 Tens of thousands rally in defense of Maduro following the attempt on his life. Milwaukee, WI - On August 4, an attempt to assassinate Venezuelan President Nicolás Maduro was carried out in Caracas. During a ceremony commemorating the anniversary of the Bolivarian National Guard, two drones strapped with explosives flew towards the stage and exploded. While Maduro was unharmed, seven soldiers were wounded. The U.S. media acted shamefully by immediately casting doubts that an assassination attempt had even occurred. All mainstream sources shared the same rumor that a power generator had exploded, hence the explosion. Oddly, all these pretentious voices of doubt grew silent when video footage emerged showing the drones flying towards the stage and detonating. In the days since then, the full scale of the plot against Maduro - and the Bolivarian Revolution - has begun to be revealed. And the truth is stunning: the Colombian oligarchy, with the support of the United States, is arming and providing shelter and training to terrorist organizations that seek to overthrow the Venezuelan government. Warning signs could be seen near the beginning of 2018. The far-right opposition had lost all credibility with their support for violent fascist street protests, and they felt it in the fall's municipal and regional elections, which they lost in a landslide. At a political dead end, they entered into negotiations with the Maduro administration. On Feb. 7, the "agreement on coexistence" was reached, and was to be signed by Maduro and every opposition party. Hours before the signing ceremony, the opposition backed out. According to the chief negotiator, they had received a call from Bogotá - the capital of Colombia - and were under orders. The opposition coalition collapsed shortly after. Some right-wing parties continued to participate in elections and rallied around Henri Falcón in the April presidential elections, who received 27% of the vote. Other parties, led by Julio Borges, declared that the Bolivarian Revolution could no longer be defeated through elections, and other actions were necessary in order to overthrow the revolutionary process. They were joined by the fascist groups that organized the infamous street violence of 2017, as well as bands of soldiers-turned-terrorists gathered around Óscar Pérez (who was killed in a shootout with Venezuelan police in January while building car bombs). Borges - the former president of the National Assembly and arguably the most prominent opposition politician in the country - relocated to Bogotá, where he currently lives in a mansion provided for by the Colombian government. Who tried to kill Maduro? Shortly after the attempt on Maduro's life, a group called the Soldados de Franelas (Flannel Soldiers) claimed responsibility for the terrorist attack. Six members were arrested in the aftermath, and their interrogations revealed that the group was based out of a farm in northern Colombia. It was there that they received training, funding and weapons, including the drones and C4 explosives used in the terrorist attack. On August 7, Reuters interviewed one of the terrorists still based in Colombia - Salvatore Lucchese, a Venezuelan ex-police chief - who stated that he had helped to plan the attack along with the men arrested. Despite having failed in their objective of murdering Maduro, Lucchese stated: "The armed struggle will continue." On August 8, it was announced that Juan Requesens, a far-right National Assembly deputy, had been arrested, along with seven members of the armed forces. Named as "one of the material authors" of the attack, Requesens is a vocal ally of the fascist groups that lynched suspected Maduro supporters in the spring of 2017. He was also one of the loudest opposition figures to condemn the "agreement of coexistence," lining himself up with Borges and the Colombian government. All were charged with treason and attempted first-degree murder of President Maduro. Arrest warrants were also issued for Oswaldo Garcia, a former military officer now living in exile in the United States, and Julio Borges, who is implicated in all of the confessions as being directly connected to the Soldados de Franelas terrorist group. The Venezuelan Supreme Court issued a statement declaring that both Borges and Requesens will be stripped of parliamentary immunity in order to stand trial for treason and attempted murder. When addressing the nation on the night of his attempted murder, Maduro did not mince words. He laid the blame for the attack squarely on the Colombian oligarchy and government, in collaboration with the Venezuelan opposition. Many international commentators condemned this accusation as brash and bombastic. Yet in the short amount of time that has passed since Maduro's statement, he has been proven correct. On August 7, far-right politician Iván Duque was sworn in as President of Colombia. And standing among his honored guests - Julio Borges and Salvatore Lucchese. They are not hiding from the world that the Venezuelan terrorist opposition has the full support of the Colombian government. Why do they do this? Because the Colombian oligarchy will never accept a revolutionary government of national liberation on its border. They have spent decades repressing the revolutionary aspirations of the people through total warfare, terrorism and political repression. Hundreds of thousands have been killed so that the oligarchy can maintain their power. Hopes for genuine reform through the peace process seem to be dead as well - hundreds of activists have been assassinated by the paramilitaries, and peasants mobilizing in support of their guarantees under the peace process have been massacred. Colombia’s newly-elected Duque government will be backed to the hilt by the U.S. government. There is no doubt about this. They will be providing as much support as possible to a Venezuelan political opposition that has openly embraced terrorism as their means for taking power. On the line are not only the remarkable achievements of the Bolivarian Revolution, but the lives of the millions of workers, campesinos, women and students who have committed to building a new society that works in their interests. We must stand with them, shoulder to shoulder, as they face the greatest threat of their movement's history.